What happens in the musical scene during Domenico Scarlatti’s life and in the following decades after his death is a further weirdness related to the Neapolitan composer. 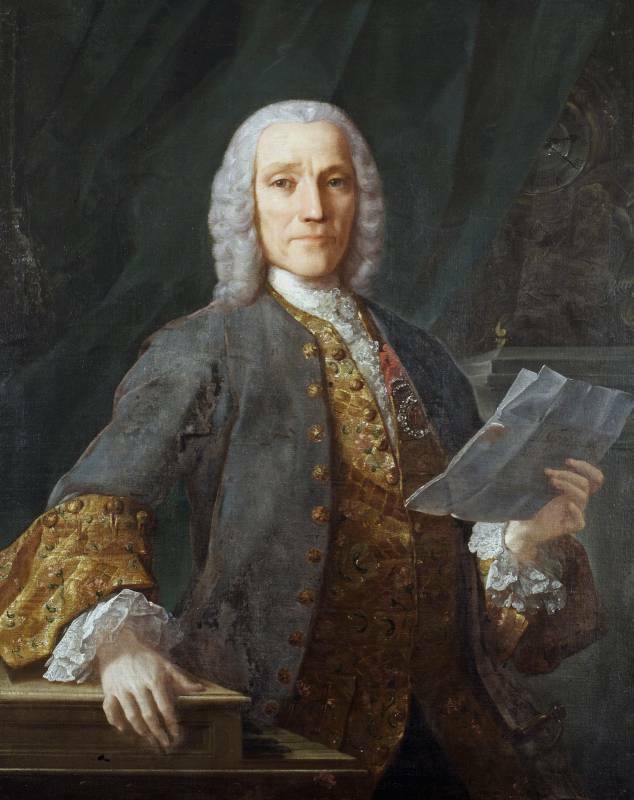 While most of baroque composers have been forgotten due to a new musical and cultural sensitivity, Scarlatti has been appreciated by his contemporaries and by the main pianists over the 19th and 20th centuries. His spontaneity has been loved, opposed to Bach’s pompousness, as well as the apparent simplicity of the language, appreciated by amateurs too, his taste for “cantabilità” and above all his technical-keyboard exploration that makes him a pioneer of 19th century pianism. On the other hand, Scarlatti’s virtuosity and brilliance hide some features to musicians who perform Sonatas and give them an image of a bizarre and talented, but not very deep, composer. His harmonic exploration has often been “normalized” and his asymmetries have been misunderstood; his rhapsodic an improvised inspiration has often been considered messy. In an effort to classify his compositional style, some musicologists talk about Scarlatti’s Sonata like it is a proto-classical Sonata, without realizing that actually we have to look for the roots of Scarlatti’s compositions in the Italian and especially in the Neapolitan Toccata of 17th century. We should also bear in mind that he did not write only for keyboard, indeed, but he composed operas, secular cantatas (during the years in Spain and in Portugal) and sacred music (among many, let me remind his last vocal work: the awesome Salve Regina, composed in 1756) that contains the typical originality and experimentation of Sonatas. 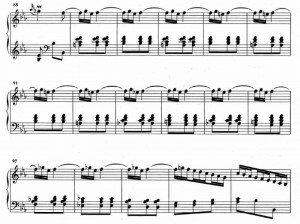 Let us try to explain Scarlattian weirdness looking for the two main stylistic influences within Sonatas: that which comes from the Andalusian popular tradition and that which comes from the Italian cultured tradition, considering that one of the main Scarlatti’s feature is heterogeneity. We know very few Sonatas with only one character. There are usually at least two or more issues and the deviation is often related to a few measures or to short parts of the piece; sometimes new hints are not developed but disappear as quickly as they have appeared. We owe Emilia Fadini the search of the Andalusian folklore elements that are in the Sonatas. Her contribute inserted in “Domenico Scarlatti Adventures – Essays to Commemorate the 250th Anniversary of his death” is a reference point for those who want to deepen the subject. If we think about a Spanish influence, our thought immediately refers to that rhythm that we generally define “flamenco” and to Sonatas such as K239 in F Minor which is characterized from the beginning until the end by the typical impulse of the Spanish dance. It isnotthe only rhythmic structure common to the Andalusian folk dances and to the Sonatas; Scarlatti also uses typical trends belonging to “Solea”, “Seguirya” and to “Seguidilla” that have more complex rhythmic cells that I will not treat on this occasion. But the Andalusian influence not only concerns the rhythm: above it covers the harmonic and melodic structure, the pronunciation elasticity, the formal organization, the use of repetition. Flamenco style comes from “Cante Jondo”, developed from 15th century in the south of Spain and originated by the melting of the ancient musical Andalusian tradition, Byzantine liturgical song elements, Oriental features from the Arabic culture and suggestions brought by gypsies coming to Spain from the East. “Jondo” means “deep” and testifies of a plaintive song, that screams desperation and impotence. – Freedom of the introductions. 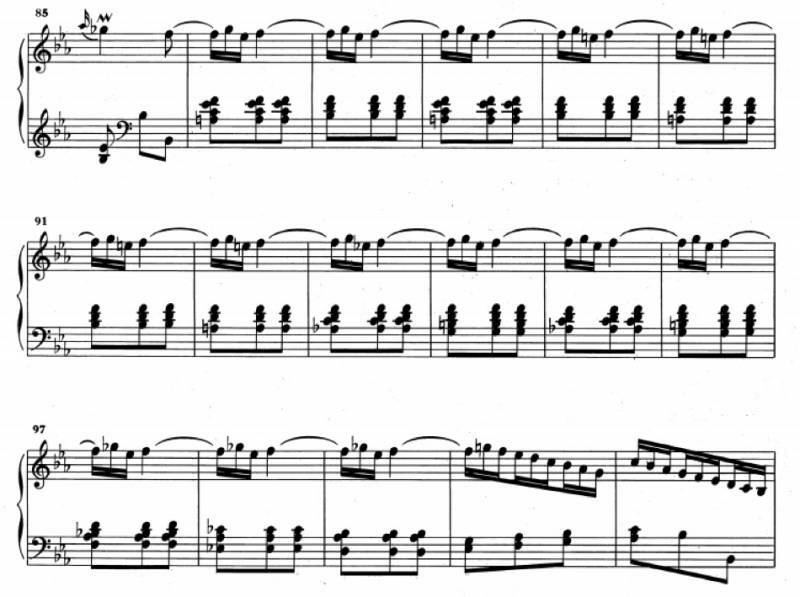 Scarlatti’s Sonatas often start with an introduction disconnected from the rest of the composition: a whole phrase, a little theme, an arpeggio, a simple gesture. In the flamenco the guitar usually introduces chants and dances freely, even if the writing uses traditional time marks. As for other features, the aim of the performer should be to put in evidence the different character of the introduction and not to integrate it with the rest of the piece, especially if it is quite different and “strange”. 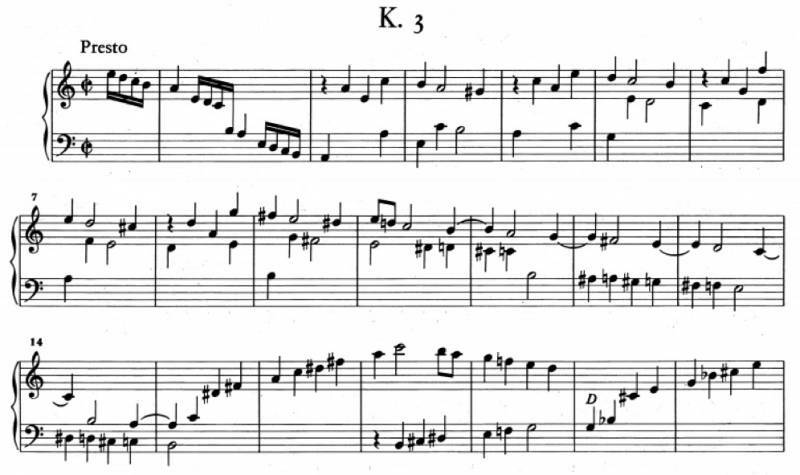 The Sonata K554 (F major) starts with 2 measures and half (a succession of descending thirds) that never come back anywhere in the piece. 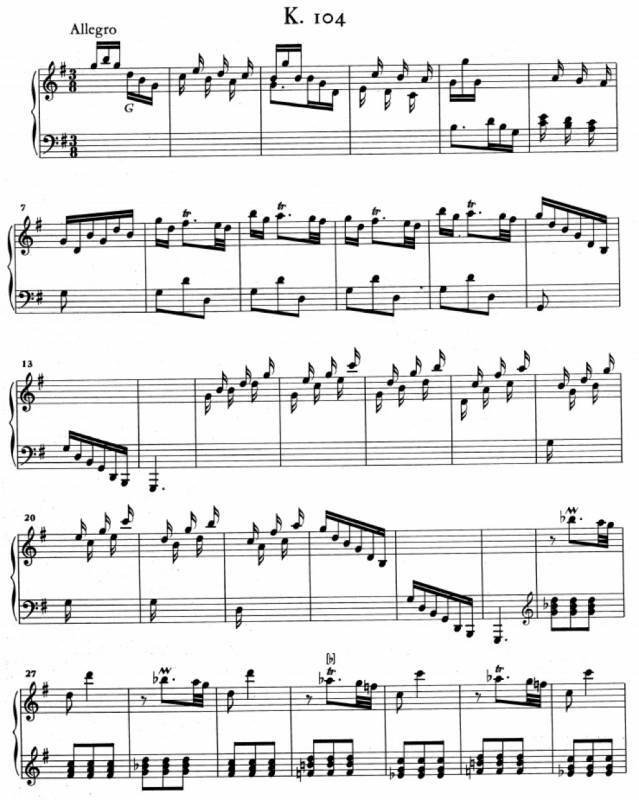 The Sonata K104 (G major) opens with two different themes (from measure 1 to 14 and from 15 to 25) and then takes a completely different direction. – Scales and Andalusian cadences. Spanish claim to have maintained the theoretical principles of the Greek musical system founded on descending tetrachords (two tones and a half from the high to the low). Pure flamenco, as Spanish musicians call it, adopts as harmonic base the descending tetrachord named “Doric”, with a half tone between the third and the fourth degree. 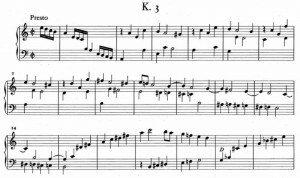 We can see in the cadence that the succession of four chords of third and fifth could involve a series of consecutive fifthsand the use of interval of a tone and a half between the penultimate and the last triad. 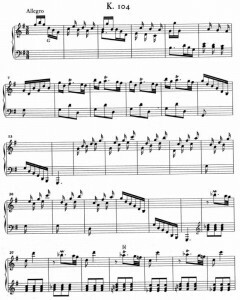 Scarlatti often uses scales and Doric cadences in his Sonatas and it can be easily noticed that, if this is not contextualized or from the point of view of the tonal harmony, this method can sound weird or even incorrect.We can also add that in the Sonatas sometimes the flamenco harmony integrates with the “suonar pieno” style, that I will further explain, learned by Scarlatti in Rome by Gasparini. One example, among many, of the use of the Spanish tetrachord: in the Sonata K6 in F major we can find the “flamenco cadenza” from measure 18 to 25. – Melodic proceedings. Some typical features of Andalusian musicarethe intensive use of melismatic features, the repetitions of a single note (sometimes accompanied by higher or lower appoggiatura) or of some small musical elements with an expressive purpose, chromaticism and expressive intervals. We can notice them clearly in the following examples.